There are a lot of offshore jurisdictions that promise special incentives to foreign investors. Some offer complete tax exemption, while others have extensive network of double tax treaties, promote business flexibility or protect the privacy of the shareholders. So, how do you choose the jurisdiction that is most suitable for your offshore company? Company law in these jurisdictions is usually modeled on UK Companies Act 1948 and is commonly found in classic offshore jurisdictions such as British Virgin Islands (BVI) as well as “mid-shore” jurisdictions such as Hong Kong and Singapore. It usually takes more time and effort in incorporating a company in the jurisdictions, but relevant law is all legislative and therefore simpler to find and follow. The American legal system has been influenced by both the Common Law and the Civil Law. Jurisdictions that follow US Law are Delaware and Panama. These jurisdictions’ legal systems are influenced by none or by more than one of the company law systems mentioned above. The UAE is a good example of a hybrid jurisdiction. It is essential for the chosen offshore jurisdiction to have a reliable and flexible legal system that may support the operation of the company. Similarly, it is also important to select a jurisdiction that has both political and economic stability, not subjected to political swings, corruption or lack of economic transparency. There are different types of legal business structures allowed in offshore jurisdictions, ranging from LLCs, private limited companies, LPs, LLPs, partnerships, corporations, and even trusts. International Business Companies (IBC) are a popular company structure found in BVI, Anguilla, Seychelles and Panama. The main characteristic of an IBC is that it is a ‘paper’ company that does not conduct any business or commercial activities in the jurisdiction where it is registered. Hence, the IBC is exempted from local corporate tax and stamp duty. Although the IBC moniker reflects the tax status and local business restrictions on the company, this entity typically follows the structure of an LLC or private limited company from a legal perspective. Similar to IBC’s structure, countries such as Hong Kong and Delaware offer offshore companies which are exempted from local corporate tax as long as there are no local trading activities and no income is remitted back to the countries. However, using this structure comes with greater risk in the owner’s home jurisdiction since these offshore companies cannot be resident for tax purposes. These jurisdictions do not offer 100% tax exemption. Instead, they have extensive network of double tax treaties (DTAs) which reduce levels of tax liability such as withholding tax. Example of such jurisdictions are Cyprus and Seychelles (only applicable to resident companies such as Seychelles Special License Company). These are classic offshore jurisdictions which offer zero tax obligation. The Seychelles IBC and Mauritius GBC2 fall into this category. 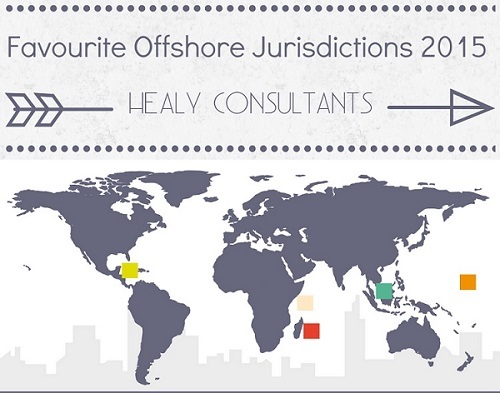 Healy Consultants Group PLC has specially picked several preferred jurisdictions that will fit Clients’ business goals. Read this document or view this infographic to find out our recommendations, or visit our website for more information about offshore company incorporation.